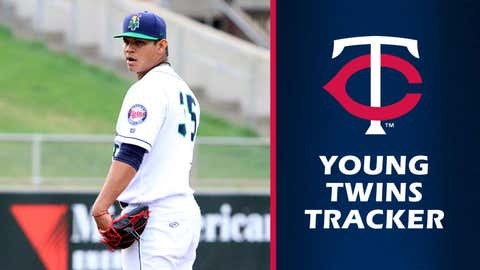 This is the ninth edition of the 2018 Young Twins Tracker. Notable: Gonsalves pitched five-plus innings of shutout baseball for the second straight week, allowing just two hits in his lone start. His command wasn’t spectacular — five walks against just one strikeout — but it was another encouraging performance from a pitcher who struggled a bit out the gate in Triple-A. Notable: Gordon continues to adjust in his second month in Triple-A, but his major-league debut could be coming sooner rather than later. Gordon has started nine games at second base since joining the Red Wings and 25 games at shortstop after starting just six times at second in 42 games with Double-A Chattanooga. If the Twins eventually opt to move Brian Dozier this year, Gordon could finally have opening. Notable: A new addition to the tracker, Graterol was reportedly promoted to High-A Fort Myers earlier this week after posting some eye-popping numbers in Cedar Rapids. The short version: The right-hander lost 2016 to Tommy John surgery, is a big fan of Twins pitcher Jose Berrios, and has a fastball that routinely reaches triple digits. The Twins’ No. 6 prospect per MLB Pipeline, Graterol is one to watch going forward. Notable: Jay was roughed up Friday, allowing three runs (all earned) on four hits in a loss to Biloxi. He gave up two hits, one a home run, in another loss to Biloxi Monday. Notable: Kirilloff’s first week in Fort Myers wasn’t quite as spectacular as his run in Cedar Rapids, but he continues to rake, and already has his first High-A home run. Notable: His eight-game hit streak came to an end Monday, but Lewis has reached base safely in 10 straight. Notable: Rooker had a productive week with the Lookouts taking on Biloxi, racking up four extra-base hits in the series. Notable: A week after getting his first Triple-A extra-base hit, Wade hit his first home run since being promoted. Others: 3B Miguel Sano went 3-for-12 in his second week with Fort Myers, striking out six times. He’s now 5-for-20 since being sent all the way down to Single-A earlier this month. … OF Byron Buxton is hitting .182/.250/.318 in his rehab assignment with Triple-A Rochester. He remains on the disabled list, but could return to the majors at any time. … OF Trevor Larnach, the Twins’ first-round pick in the recent MLB draft, hit a two-run homer Wednesday in the College World Series to help Oregon State to an improbable win over Arkansas in Game 2.